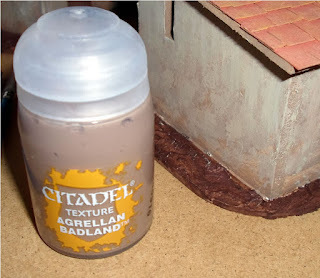 I picked up one of the new range of Citadel Texture paints to try, on a whim really. A weird whim as I rarely use their products, though I do have a set of their old washes I find useful for certain jobs. In general I find their product good, but far too expensive. However if it will tackle a specific problem nothing else will do conveniently I'll take the hit. The texture range look like they might be such a product, and appear good value too, until you realise the posts cost £4.55 each! yikes! Another issue for me was sloppy storage of the pots on the shelves - kids!. I wanted a cracked, sun baked earth finish, which in the range is offered as Agrellan Earth (or the much redder Martian Ironearth). But I ended up with a pot of Agrellan Badland. And didn't notice the difference until opening it. Ah well, let's press on. Know what you're buying before you part with the cash! Now the advice for these is to paint it generously onto a prepared surface, whose base colour will show through. 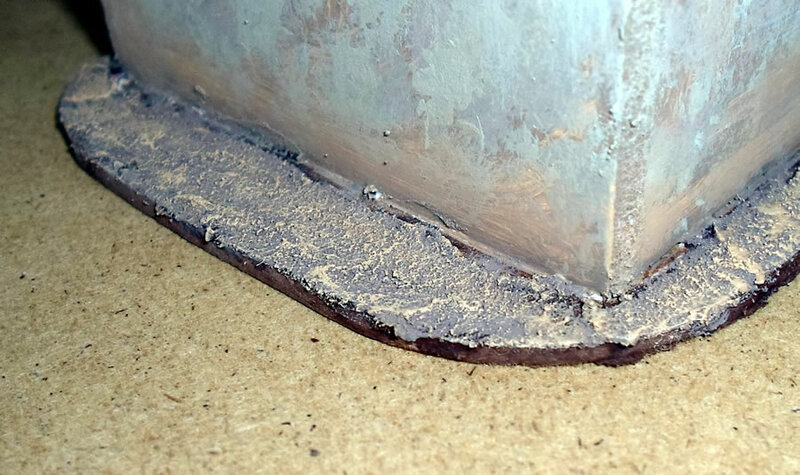 For that I applied a thin skim of filler and coated it a cheap burnt umber. As you can see in the picture above; up to this point I was still thinking I'd be getting some nice hard packed Mediterranean clay. Not so. the Agrellan Badland is a gritty paint; basically with micro crystals filling it in various sizes. The advice is less to bush on as to splat it on in lumps and move it around - stipple it - to get an uneven coverage. In fairness this it did well, and once dry the coverage wasn't too bad. At this stage I was curious as to what might be in the paint. 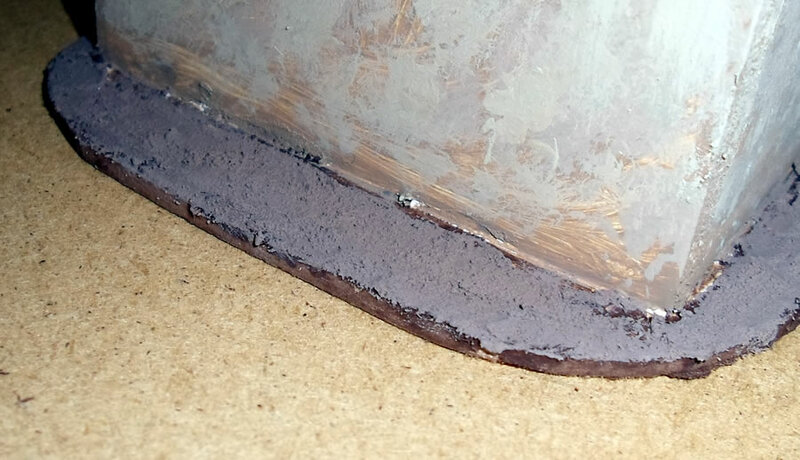 A quick finger test of a small amount revealed that the acrylic carrier was full of, well, grit. Thankfully it doesn't appear to be microbeads, rather something organic. So that at least is a good thing. The size of the particles varied and they would further break down between the finger tips. Any how, now it was time to apply some highlights to bring out the texture. I started from a desert sand and worked up in my usual fashion. The look? Well it's pretty good, the combined effect is better than filler alone, but not as textured as fine sand. It's less uniform which may well appeal to some. However, and this is a big but, this is a long and expensive way of going about getting the same effect you could have got with either coloured fillers, basetex type products, or just sand and paint. I'm not convinced this particular product is worth it. Not least as I used about a third of a pot on about the equivalent of a 10x20cm area. around £1.50's worth. The filler, sand and acrylic paint for that amount of space might add up to five or ten pence I guess! But I will get a pot of the correct crackle effect paint when I next have a project it would suit, and try that instead. If that works as it should I cant think of an easy way of replicating the effect and it could be more completely recommended! I've been experimenting with Agrellan Earth and quite like the effect, although you really have to shovel it on to get decent cracks. I would recommend it, but it's good to know that the badlands is one I can skip. I really like them. They have helped me getting into basing which had always been an issue for me. These texture paints dry out quicker in the pot - I only found this out after finishing the second part of a WWII US force. I haven't tried out the one that drys with a cracked effect, but will be interested to see what you think of them. The pots I got were total crap. I switched to art store crackle paste. Go to a craft store like Michaels or Hobby Lobby and buy crackle medium to use with any acrylic paint - way cheaper and goes much farther. Golden (found in any art store) has lots of textured paints in larger containers.